The new O.P.C. system specifically designed for Rangermatic and Revermatic Power Shift Transmission family. With safety in mind, this unique system offers vehicle manufacturers new anti-collision capabilities. By using distance sensors mounted on the vehicles front and rear bumpers, the Obstacle Proximity Control (O.P.C.) interfaces with the power shift transmission providing operator-free, uncompromised, speed and brake control. The O.P.C. system mandates automatic extremely low speeds (inching) when the vehicle is in close proximity to any object allowing the operator to concentrate on maneuvering and positioning. Several speed limits can be set, to accomplish different speed limit zones, simply achievable by engaging and disengaging Transmission clutches during inching mode operation. If a collision is imminent, the O.P.C. immediately reacts putting the transmission in neutral and fully engaging the hydraulically operated brake to stop the vehicle and to prevent costly accidents and personal injury. When used with the multi-speed Rangermatic Transmission the O.P.C. fully controls the shifting of gears providing the user the ease of an automatic transmission. 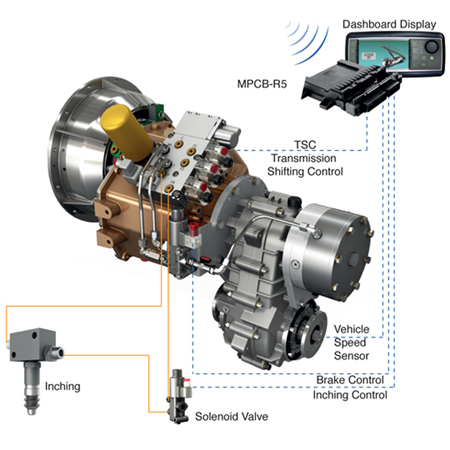 The heart of the system is Transfluid MPCB controller with dedicated and programmable software. The MPCB has multiple e-stop and e-inch inputs that can be used to slow or stop the vehicle for other functions such as a vacant operator seat or if machine implement is operating during transportation. Additionally the MPCB provides the user accountability by recording all O.P.C. events that can be reviewed to determine operator abuse and misuse.